Ebrahim K. Kanoo, the sole distributor of Lexus vehicles in the Kingdom of Bahrain, announced the arrival of the all-new 2019 Lexus ES. 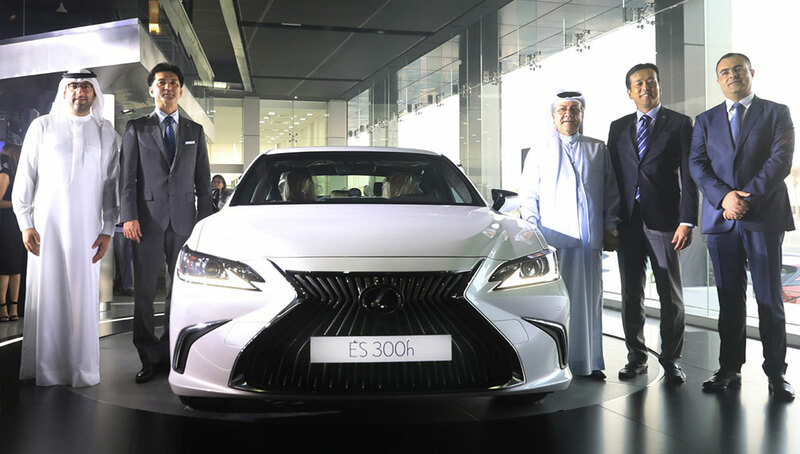 The highly anticipated ES models, ES 350, ES 300h and the first ever F SPORT were launched at the Lexus showroom by senior delegates from Lexus international and Ebrahim K. Kanoo, to Lexus enthusiasts and media representatives. The engineering team, led by chief engineer Yasuhiro Sakakibara, had one clear goal when it came to the ES: ‘Transform its image.’ That meant further sharpening a sedan, known primarily for comfort and quietness, and adding class-leading handling and power that you can feel and hear. According to Sakakibara, the all-new Lexus ES has been built to deliver a fundamentally higher level of performance than any of its predecessors. He revealed: “With every new generation of the ES, the team works towards exceeding our customers’ needs and expectations. The all-new 2019 Lexus ES embodies our vision of developing a model that blends key elements of design and performance in a way that would deliver a higher level of enjoyment for its drivers and passengers”. This was achieved with the help of the all-new Global Architecture – K (GA-K) platform, giving Lexus the opportunity to explore the limits of mid-size luxury sedan design. The car is longer, lower and wider than its predecessor. The longer wheelbase allows the wheels to be pushed closer to the car’s corners, with wider front and rear treads. Its stance and proportions reflect its new-found performance capabilities and give the ES the kind of eye-catching appeal that will make owners and admirers take a second look. One of two major additions to the all-new Lexus ES lineup includes the ES 300h, an electrified hybrid model, which combines two power sources consisting of a petrol engine and two electric motors. The second addition is the all-new 2019 Lexus ES F SPORT model that features numerous sporty upgrades such as a retuned suspension, 19-inch wheels and tyres, and unique aluminium interior trim that gives the machine a more dynamic look and feel. The introduction of the all-new 2019 Lexus ES continues the expression of the brand’s design direction and commitment towards crafting vehicles with heightened excitement, emotion, and passion. The provocative elegance of the design starts up front with the latest iteration of the brand’s signature grille, but adds individual cues that are unique to the ES such as the vertical grille pattern and satin-plated trim, adding slim headlamps with distinctive L-shaped marker lights. In profile, the ES has a dynamic yet fluid shape that starts with the low hood line that feeds into the sleek roofline. The rear of the all-new Lexus ES is clean and sharply chiseled, with distinctive three-dimensional, L-shaped LED tail lamps. Complementing the all-new Lexus ES emotional design is a thrilling drive personality imbued by 2 powertrain options. The ES 350 is powered by a 3.5-liter V6 engine that is designed to deliver commanding acceleration along with an invigorating sound. With an update to the D4-S fuel injection system, the impressively smooth engine now produces 300 hp and 36.4 kg-m of torque. In addition, an electrified hybrid powertrain was developed for the all-new ES. This 2 powertrain options combine two power sources consisting of a petrol engine and two electric motors, producing a combined system output of 215 hp. This powertrain is also mated to a new hybrid transaxle that provides the lowest fuel consumption value of 24.4km/L, and highest driving performance of this class. The class-leading hybrid electric model ES 300h can be driven entirely by either electrical ‎power with zero-fuel consumption and carbon emissions, or with a combination of a petrol ‎engine and two electric motors, depending on the vehicle’s speed and customer’s driving behavior. ‎The batteries in the hybrid electric drivetrain are automatically charged by either the petrol ‎engine or when braking and decelerating, eliminating the need to plug in a power cord. Completing the all-new Lexus ES’ distinct personality is its exquisite interior that invites the driver and passengers to enjoy a range of advanced features offering a refined cabin experience. These include an enhanced in-vehicle 12.3-inch multimedia display, a 10.2-inch coloured and adjustable head-up display (HUD), a 7-inch color multi-information display (MID), a wireless charging system for smartphones, an LED ambient illumination, the Lexus Climate Concierge with a 3-zone independent temperature control system, a 17-speaker Mark Levinson sound system, multi-adjustable power and ventilated front seats, power reclining rear seats, a rear armrest with multi-operation panel, and a hands-free power trunk lid. Available in 12 distinctive exterior colors, the all-new Lexus ES allows customers to express their individuality with two exclusive colors for the F SPORT version. Two newly-developed exterior colors, Ice Ecru Mica Metallic and Sunlight Green Mica Metallic, further evoke the luxurious and glamorous atmosphere. On the other hand, the interior comes in a total of five color schemes, with two new schemes called Rich Cream and Chateau, and an exclusive scheme for the F SPORT. There are five available ornamentations depending on the grade, with three new designs, including Bamboo, Shimamoku Black, and a Dynamic pattern called ‘3D Film,’ along with one exclusive design for the F SPORT. To explore the new ES and book your test drive today, please visit the Lexus showroom in Sitra, call 1773 7773, or visit www.lexus.com.bh.